This potato salad, combining white or golden potatoes and sweet potatoes is one I often make for company. It’s so pretty, perched on mixed greens and ringed with grape tomatoes and avocado, yet is incredibly easy to prepare. It’s wonderful for summer and early fall potlucks and other gatherings. 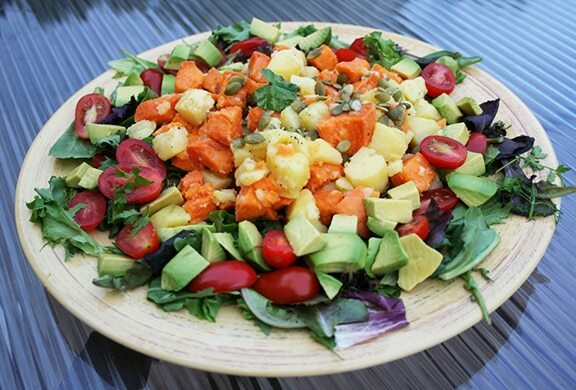 This potato salad, combining white or golden potatoes and sweet potatoes, is so pretty, perched on mixed greens and ringed with grape tomatoes and avocado. Cut the sweet and white potatoes into large dice (about ¾ inch). Combine in a large saucepan with just enough water to cover. Bring to a slow boil, then lower the heat and simmer until done but still nice and firm. When the potatoes are done, drain them in a colander and rinse under cool running water until just warm. Combine in a mixing bowl with vinaigrette; season with salt and pepper. Line a large serving platter with the greens. Mound the potato mixture in the center. 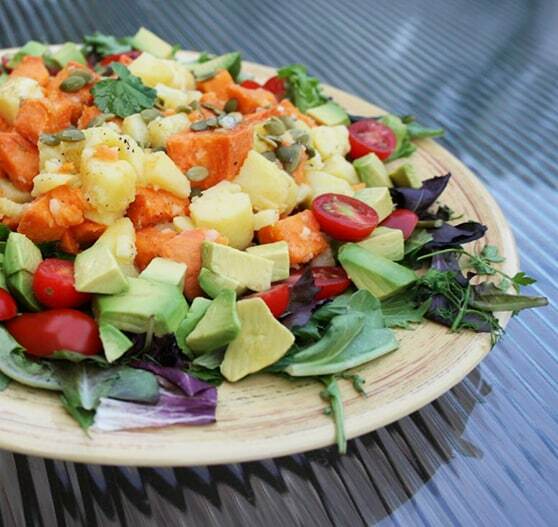 Scatter the tomatoes and avocado around the perimeter of the salad. Top the potato mixture with a sprinkling of pumpkin seeds. Serve at once; pass around additional vinaigrette as desired. Here are more recipes for colorful green salads. Return to Jewish New Year (Rosh Hashanah) recipes and menus. Lucky Me! I happen to have all the fixin’s. Guess what we are having for dinner! Just finished making ours. Just waiting on the hubby to come inside and partake. All to ourselves–sons aren’t home tonight!